About Us: St. Finn Barr Catholic School was founded as a parish school in 1962. It was originally administered by the Irish Sisters of Mercy until 1997 and by the Dominican Sisters of the Most Holy Rosary of the Philippines until 2003. Today, the school is under the leadership and guidance of lay administrator Mele Mortonson. The school continues to provide a tradition of academic excellence, serving culturally diverse students from St. Finn Barr and other parishes in the San Francisco Bay Area. 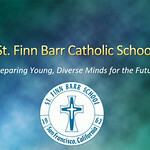 Fully accredited by WASC and WCEA, St. Finn Barr prepares students for success in high school and in today's world with solid academic and spiritual foundations. Learn more about us by visiting our website.